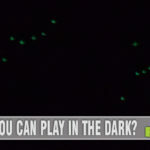 Is it a Game or an Educational Tool? Home / Educational / Is it a Game or an Educational Tool? Since Miss M was about 2, we’ve had our old, essentially useless-to-us, laptop hooked up for her. It doesn’t have internet access but plays most children’s games just fine. We were delighted that she learned how to properly shut down a computer at a very young age and learned how to maneuver a mouse early on also. When Miss K was old enough to use it, we started her also. While some parents told me they couldn’t believe I let the kids ‘play’ on the computer so young, I hold steady with my position that giving the kids a variety of learning tools is nothing but good. When complimented by other activities, it just reinforces what they’re learning. One of the types of software we allowed was the JumpStart series. Although they are games, JumpStart programs are also educational. Kids learn while they’re having fun. Win/win as long as it is used in moderation. So when I was offered the opportunity to review JumpStart Pet Rescue for the Wii, I jumped at the chance. We love our Wii; we’ve had great experience with JumpStart. That combination has nothing but potential. From the minute it arrived, Miss K (who traditionally isn’t the gamer geek of the family) was pestering me to play it. “Moooommmmm… Can I play the video game, please?” “Mom, WHEN can I play the video game?” Here my child is begging to play an educational game and here I am telling her “Not yet.” In my defense, I didn’t want her playing it unless I could be there to help, to learn about it and be able to review it. Well, she finally got her wish. We loaded the game and started in. 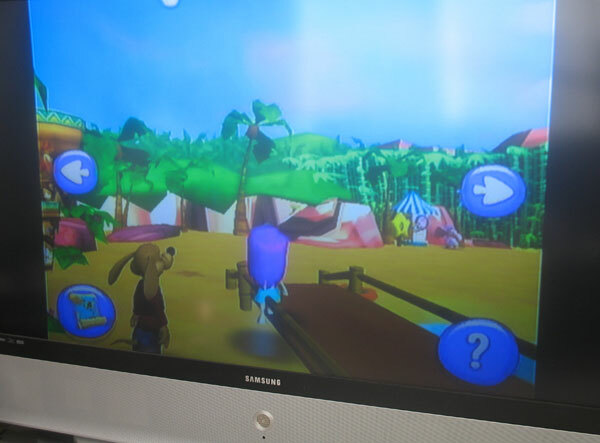 JumpStart Pet Rescue for the Wii is geared at children ages 3-6. With that said, my girls (ages 5 and 6) are both at the upper end of the spectrum so I cannot attest to how a 3 year old would do handling it.Let’s start by answering one simple question – Do I feel that JumpStart can maintain their same level of educational presence utilizing the Nintendo Wii? My answer to that is yes. Because the Wii is so versatile, it’s able to make some activities more functional than JumpStart could ever do on a computer. As an example, in every ‘world’ the child can find pictures, wave the WiiMote and ‘paint’ the picture. 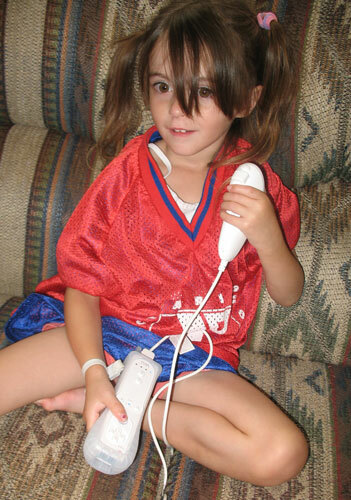 A similar exercise utilizing a computer would simply have the child mimicking a scribbling motion with the mouse. JumpStart Pet Rescue for the Wii has various worlds that contain different activities, games and challenges. But before your child can go off and explore, the first thing is to create their character. Choose different colors and styles of hair, clothes and shoes. Different expressions of mouth, different skin tone and eye types. Miss K easily navigated her way through setting up her character and my only complaint is that there wasn’t a timer on the process. She was perfectly happy spending a half hour just creating the perfect little person to run around the JumpStart world. It’s a game, so you’re probably wondering how it can be educational. My prior descriptions of how the world is designed and character creation make it sound more recreational than educational. Once inside the world, there are games and puzzles integrated everywhere. 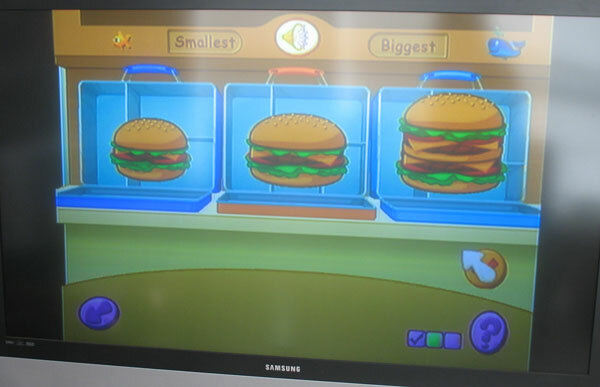 One of the first games that Miss K came across was a series of comparison games. “Smallest to biggest” “Shortest to longest” and even concentration. After successfully completing, a present is awarded. In Musical Caverns, you follow Pierre’s path to make your way through the cavern. He shows you the way, then you do the same. Miss K continually had problems and I wasn’t any help. I’m thinking “Simon” where you follow where he went. I felt like a bit of an idiot when my 1st grader had to explain to me why Miss K was having trouble. “Mom, he’s making a pattern. She’s supposed to do the rest of the pattern by going over that way.” Guess what. That worked. Apparently Miss M was listening to the instructions better than I was. So the Musical Caverns thing is all about patterns – not memorization. Patterns. Duh. 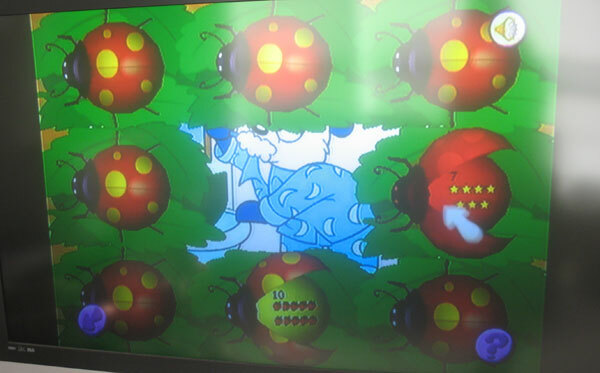 Modified versions of games like “Hide and Seek” are throughout the game. Clues about “hiding behind something green” or “behind the number 2” are used. Although the game states it is for children ages 3-6, I believe that kids who are kindergarten won’t benefit as much from the game in terms of ‘learning’ as a younger child. For the younger end of the age spectrum, JumpStart Pet Rescue for the Wii is a great opportunity to help reinforce basic principles. Families could utilize this as a reward to see how well their children learned in their traditional preschool (or home-schooling) sessions. On the flip side, I believe that kids at the upper end who already know their colors, patterns and other theories can get a self-esteem boost by being able to do the games with high success rates. When I asked both Miss K (age 5) and Miss M (age 6) if it was too easy, they both said “No, Mom, it’s perfect.” They enjoy it and it has educational properties… works for me. And after all that, I haven’t said a thing about why it’s called “Pet Rescue”. It’s because in one of the worlds, the child is able to adopt a pet and do various activities with them. Let me make it clear that it is nothing like Littlest Pet Shop or Webkins so don’t let the name throw you off. 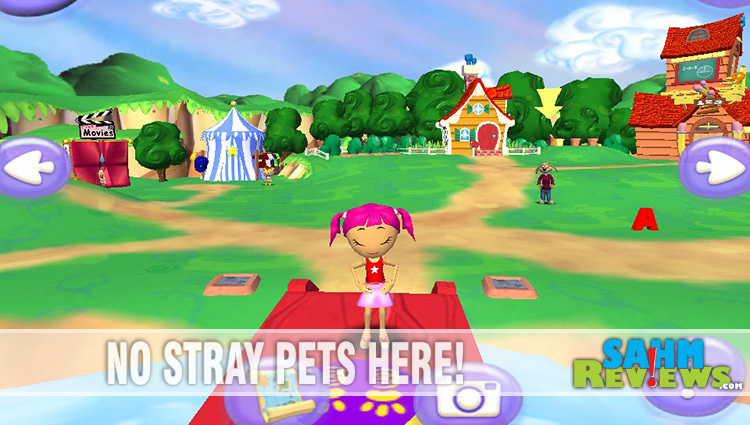 JumpStart Pet Rescue for the Wii is a learning tool disguised as a game. Would I recommend it? For younger kids, definitely. Even for kids that are starting Kindergarten that had limited preschool exposure. For kids that are well-established in Kindergarten? Probably not unless there are younger siblings in the house to utilize the game when they outgrow it. Don’t have a Wii? 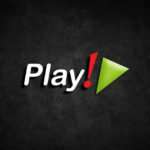 Check out the online game! For more information about JumpStart, find them on Facebook, Twitter or read their blog! Great review! Good for you for introducing your children to computers – I think people forget what an amazing tool computers are and how important it is to learn those skills. Just because a child *could* play video games for hours on end doesn't mean they have to – there's so much to do and learn with a computer. Sounds like this is a great educational tool!